My son Jean-Michel is wearing the costume. He is 6 years old. My boys love to play video games and one of their favorite games is Arkham City. My son loves the Riddler and the color green so it was no surprise that when his older brother told him he was going to be the joker for Halloween that Jean-Michel would ask us to make him a Riddler costume. But he did not want any conventional Riddler costume he wanted to be the Riddler from the videogame. Our son is tiny so we had to create the entire costume from scratch. We used green twill cotton fabric to sew the pants and blazer and lined it with purple satin fabric for a more elegant look. We sewed a large gold & Black question mark we created with gold and black fabric. The gloves were made of purple velvet fabric, The tie was made with purple satin fabric and the small question marks made of gold vinyl material were hot glued onto the suit. The hat we bought from a Halloween store and it's a suede material and we hot glued purple ribbon around the rim. The glasses were bought from amazon and the white button up shirt was bought from Walmart. 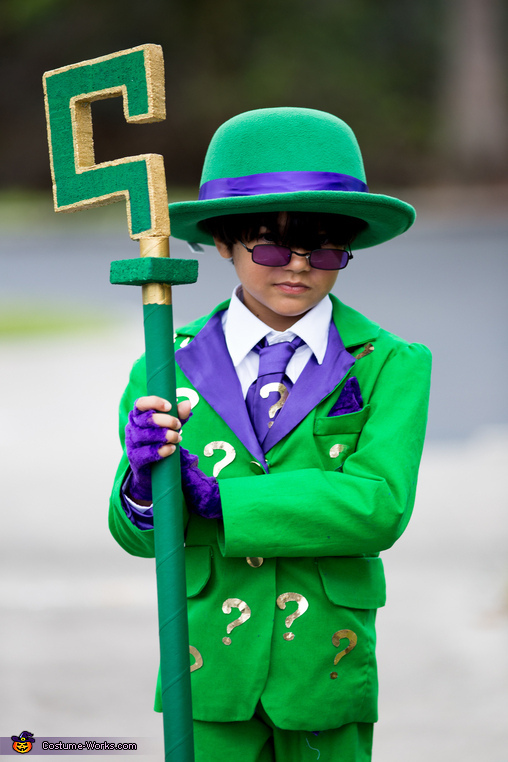 The Riddler staff/Oversize cane was made with cardboard and foam and then painted with gold and green acrylic paint. Overall cost for the materials we used was over $100 in materials and we made the costume ourselves to save on labor costs.